The Eastern League announced on Monday that Trenton Thunder right fielder Zoilo Almonte was selected as the winner of the Eastern League Player of the Week Award for the period of June 11th through June 17th. Zoilo Almonte batted .455 (10-for-22) with two doubles, one home run, 10 RBI, five runs scored, four stolen bases, two walks and a .682 slugging percentage in six games for the Thunder last week. Almonte, who is a native of Santo Domingo, Dominican Republic, kicked off his week by combining to go 4-for-6 with a double, three RBI and one run scored in a doubleheader sweep at Altoona on Wednesday night. He went on to record two more multiple hit games during the week and drove in or scored at least one run in all six of the games he played in last week. The 23-year old drove in a league-high 10 runs last week and also finished among the weekly league leaders in batting average (.455-2nd), hits (10-tied 2nd), steals (4-tied 2nd), total bases (15-tied 4th), slugging percentage (.682-tied 6th), extra-base hits (3-tied 6th), OPS (1.182-7th), on-base percentage (.500-tied 7th), runs scored (5-tied 7th) and doubles (2-tied 7th). 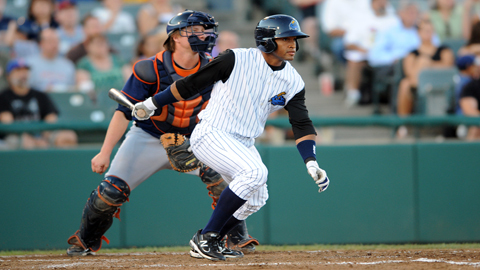 Zoilo, who currently has an eight-game hitting streak and has collected at least one hit in 19 of the past 20 games he has started, was signed by the New York Yankees as a non-drafted free agent on July 2, 2005. Almonte joins Ronnier Mustelier (April 30-May 6) and Yadil Mujica (April 23-29) as Trenton Player of the Week award winners this season. Zach Clark, a right-handed starting pitcher for the Bowie Baysox, was selected as the Eastern League Pitcher of the Week for the period. All Trenton Thunder tickets are on sale now at trentonthunder.com.